That title has nothing to do with anything in this post. However, should you feel inspired to giggle, you can always watch Michael McIntyre’s Comedy Roadshow and on one of them, you’ll see a Welsh guy named Steven Williams. He will say “Ooh, look: A bumblebee!” I guarantee you that you will laugh. If it weren’t 10:35 pm and thus past my bedtime, I’d go watch it right now. It’s that good. You’re welcome. I guess I just made my title refer to the content of my post. I assure you, this was not my aim. I fully intended it to be just a random quote I picked out of my memory banks. Sometimes, though, I’m too clever for my own good. Oooh, but you know what? I forgot to tell you the best part about yesterday’s hot yoga class: Bending & Boiling, Part Deux. There was a girl in front of me (who has clearly done hot yoga before, inasmuch as she, unlike me, was not wildly looking around the room as if to say, “What’s going on? How did I end up here, inside the molten core of Earth herself?”) whose nose just started bleeding. I’d noticed it for quite some time, but was too damn hot and bothered (not in the way you think, either) to mention it. Also, people don’t talk in hawt yoga and I was not wanting to break the rule, just in case they sent me to an even hotter corner to sit and think about what I’d done for punishment. Um, yes. Yes it surely is. Unless you sweat red, my friend, and if you do, you have a whole other set of problems. Gives a whole new meaning to the saying “Blood , Sweat and Tears,” doesn’t it? I bet you’re intrigued now, aren’t you? In 2005, Adam and I went to Disneyland. It was the funnest. Time. EVAR! Seriously, there are many yarns I could weave about that adventure-laden expedition, which I shall mete out in small, delicious morsels, lest you be overcome by the EXCITEMENT of it all. So, anyway, they sell all these princess costumes for the little kids to wear there. Any little girl can be her choice of princess, but alas! 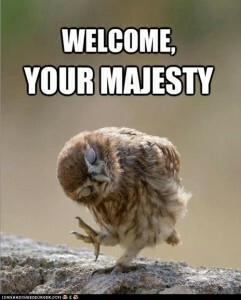 Not so for the more mature (you have to pronounce that “mat-ooor” for the full effect) royal wannabe, such as myself. Oh, the humanity! So, I went to the princess section, bought a tiara and stuck it in for the remainder of the day. I mean, really: the kids’ mouse ears have elastics on ’em, so the kid can wear them about, but not the adult ones. I guess we’re meant to just sit still and watch happiness happen, to avoid any gentle breeze that might knock my last vestiges of childhood from my head. Why, yes; it bothered me—how can you tell? But I digress. While wandering around California Adventure, a park employee dashed out in front of us from one of the movie-making buildings (I don’t know what they’re called, but you can go in and see/learn things, I think. I don’t know for sure; we didn’t go in because we were too busy having The Time of Our LIVES). He was gasping like he’d run the Boston Marathon, holding one hand up to stop us. We thought we must’ve dropped something. And then. You guys. Then, he takes a step back, makes a massively regal-looking and graceful bow to me, and announces, “Your Majesty!” FOR ALL THE WORLD TO HEAR. Didn’t I just die (of happiness)! Best. Moment. EVAR! Seriously. This guy wins like 9 zillion customer service points from me. Well, that was fun. At least it was for me. Aaaand, that’s what really matters. Adieu! You know when you can feel things ramping up at work and you’re mildly concerned because you have no idea what you’re doing? No? Just me? Well then. Aren’t I lucky. I’m feeling morose. On account of it being Thursday and all. Thursdays go from 8:30 am until 10 pm. That is long. I cannot brain anymore. Though, my neighbour in InDesign tonight made me laugh so hard tonight that it nearly made up for the day of meh. You know when you are laughing at something that’s not really that funny, but you can’t stop? Those moments that occur usually at incredibly appropriate time and places, like in class, or church. You guys. I was crying. Tears of mirth. Well, this made me smile. 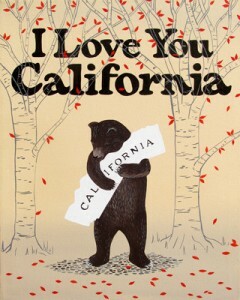 I like this bear, who likes California. I like California, too. I could so use a road trip right about now. I'm not stealing this image. I'm promoting it. Buy this print. I want to. It’s almost the weekend. Come on, Friday! Speaking of weekends, this Saturday is Adam’s Law grad formal. I’m pretty excited. The girls and I are getting mani/pedis (ooh!). I’m still not sure what to wear, though. “Formal” is throwing me. Do I wear an evening gown? Because I could, you know. I have several (just in cases). I also have tiaras. I need to wear them more, too, so that’d really solve a couple of problems. On that note. I’m off. Ciao. It is an owl. Enough said. It’s bowing to my royal self, not unlike that employee at Disneyland who MADE MY DAY!